Budapest has a reputation for being a party city, but few visitors actually know how complex and eccentric the city’s nightlife really is. From rooftop bars and decadent spa parties to jam-packed discos, Budapest has an abundance of venues where you can slam a drink or shake your booty. On we latest visit to Budapest we stumbled upon the ruin pubs, a chain of funky bars that are unique to the city. We’ve been coming to Budapest for almost 15 years and yet no one ever mentioned “ruin pubs” to us. Well, I guess if we were younger we would have discovered them sooner. 1 What are the Ruin Pubs? What are the Ruin Pubs? In short, the ruin pubs are quirky bars and nightclubs opened in abandoned buildings. An ingenious way of recycling spaces. They are a hybrid of bar, nightclub, café, and beer garden, that have been built in dilapidated spaces in Budapest’s District VII. Once the site of the Jewish ghetto, this area of Budapest became derelict in the decades following World War II, after the deportation of the Jews. 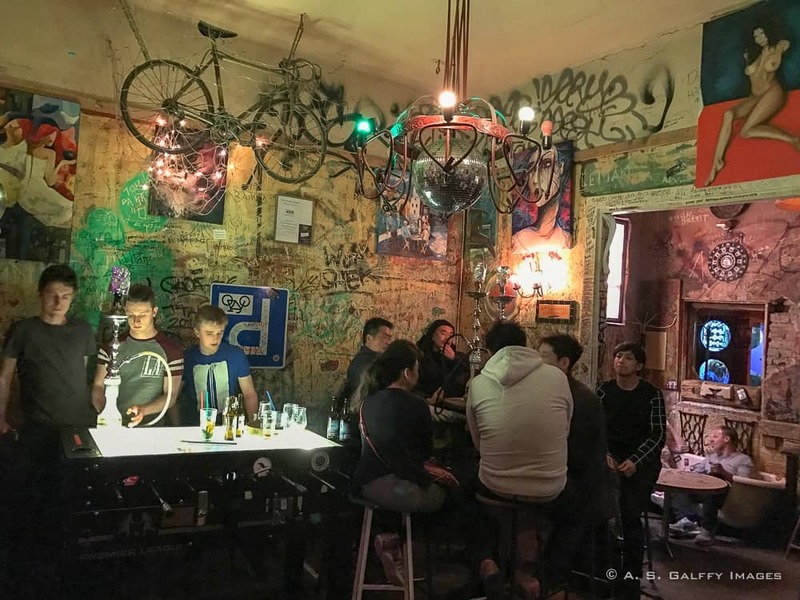 It all started as an experiment in the early 2000, with the creation of Szimpla Kert (Simple Garden), a bohemian bar set up in an abandoned building on Kertész utca, offering affordable drinks for the young crowd in Budapest (later the bar was moved to Kazinczy utca.) Szimpla Kert shortly became the hottest place to party in Budapest and at the same time created a trend for reusing abandoned spaces. The following year more ruin pubs started to pup up all around the city. In the early days of the ruin pubs many of them had been closed down due to legal problems concerning the safety of the buildings. Eventually, the ruin pubs became such an iconic part of the city that people would come to Budapest especially to sip a glass in these crumbling taverns. An estimated 30 ruin pubs are now in the city, each one of them with its own personality. But they all have a few things in common: an old abandoned building, raw-brick walls covered in graffiti, mismatched furniture, funky props and a bohemian atmosphere. Some of these bars are so inconspicuous among the buildings that they are difficult to spot. From the outside they look like regular homes. There are no signs pointing the way, no long lines at the door. But once you get into the inner courtyard, you are in the middle of a funky bar. All around you people are dancing, drinking, talking and having fun. The ruin pubs don’t take long to visit, so make sure you drop by even if you only have one or two days in Budapest. 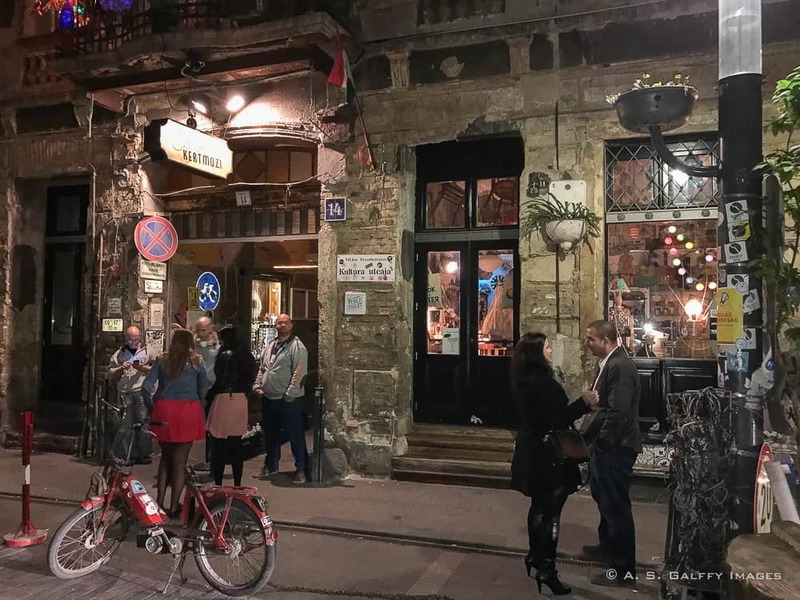 Szimpla Kert (Kazinczy utca 14, 1075 Budapest) was the first ruin bar opened in Budapest. 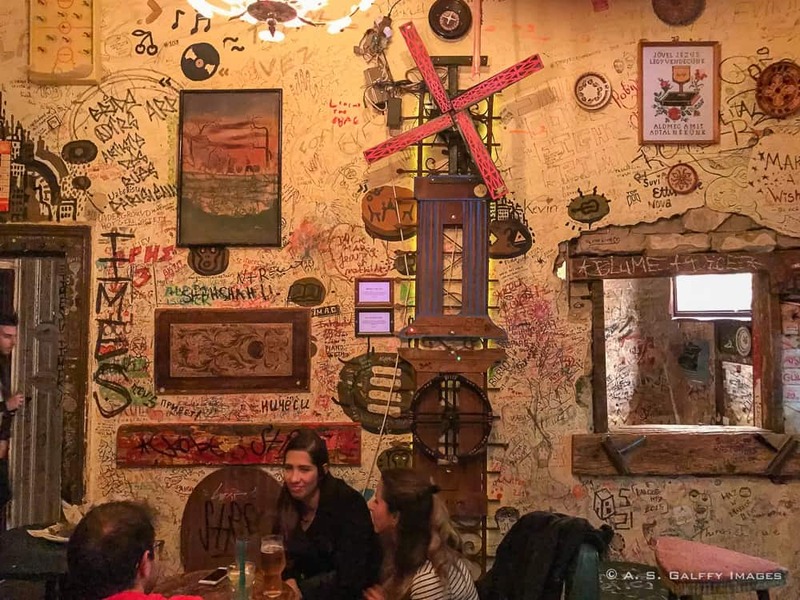 So if you are in town for some fun, Budapest’s ruin pubs will surely not disappoint you. What a great way to utilize abandoned spaces and homes. Have never heard about these 'Ruin pubs' before. Glad, you introduced us to this through this post. I wonder if the structures are safe though! It is, isn't it? I thought so too. oh my goodness, how super cool! I am absolutely loving the idea of the ruin pubs - what a great way to make use of abandoned buildings - hopefully none are haunted hehe. Very cool to learn there are more than 30 ruin pubs in the city, what a fun way to explore Budapest. It would be fun to explore each of its unique personalities and take photos of the graffiti, and mismatched furniture. Plus I'd imagine the drinks would be fun too! Oh, I didn't know Prague has ruin bars as well. I'd love to visit those too. Budapest is surely a cool place. I love the nightlife there. They have the coolest pubs and this Ruin Pubs that you have mentioned of is certainly a place where I would love to hang out. Such crazy designs on the walls, definitely attractive! I have never heard of 'ruin pubs'. What a great idea for the old abandoned buildings. A great way to bring back life to areas in a city! Thanks for sharing. It is definitely something I would like to do when visiting Budapest. I love the concept of a "ruin pub". I haven't heard of these before, but they sound like really neat. I would be very interested in learning more about the history behind each building as I visited. Thank you for the sharing- I'll definitely add these to my list of "must-sees" for Budapest! That's a nice and interesting concept. Had not heard about ruin pubs before. Though I am a teetotaler would still like to explore them. Nice piece, thanks for sharing. Hi! Just got your blog link at a social sharing website ShoutmeLoud because I am travel lover and willing to read something about Traveling. Same as I accidentally found a website and amazed by their great collection of beautiful travel gifts. Its a must check. Thank you. Hope you find my articles useful and entertaining. Hope to see you around at our weekly blog link-ups. I've been hearing about the 'ruin' bars! This is perfect timing as I'll be visiting Budapest soon. Great post and pictures. Hope you'll have a good time in Budapest, Elaine. Let me know how you liked the ruin bars. These sound fascinating. I love abandoned buildings and to find a use for them like this is so clever. i wish I had known about them when we were in Budapest a few years ago. Hi Anda, I'd like to say that these ruin pubs are awesome and I'm sad I didn't know about them the first time we went to Budapest, but when we go again one day, we'll definitely check some out! Nothing is lost, Lolo. You live in Europe so Budapest is just around the corner from you. This is an interesting bar idea. I wonder if it has spread to other cities. I guess it would have to be cities with abandoned buildings. As far as I know, Budapest is the only city that has the ruin pubs, but it's possible that other places in the world adopted the idea too. Fabolous place and description of it. We got to the place right off the plane coming from LA, nice intro to Budapest's nightlife !